The story revolves around a classic love triangle. Sharp-tongued Lili Stevens (Lupino) is hired to sing and play piano at Jefty’s Road House by Jefty himself, played by Widmark. He initially hires her because he wants to jump her bones, but once he hears her sing like a goddamn angel, he knows he’s found a goldmine. The usual crowd doubles and soon the bar is swamped with patrons eager to hear Lili belt out a few numbers in that sultry, smoky voice that brings men to their knees. The manager of the road house is Pete Morgan (Cornel Wilde), a no-nonsense cat who’s seen Jefty’s infatuations shift like the tides. Off the bat, he thinks Lili will be outta there in a week, after Jefty’s desire wears off. In one truly remarkable scene, Lili lets Pete know she ain’t going nowhere till here contract is up and she’s taken “every rotten dime” that’s owed her. Lupino really gives a knockout performance here. Femme fatale she is not. Much like Lupino offscreen, you can’t pigeonhole Lili . After some initial friction, Lili and Pete become lovers. When Jefty returns from a hunting trip and catches wind of their romance, he goes into full on Tommy Udo mode. He frames Pete on a trumped-up charge and then, in a ingeniously despicable turn of events, has the judge order him to be under his care. Pete becomes a prisoner of Jefty. He can’t leave the state, he cant’ strike out at Jefty, and, what stings the most, he can’t marry Lili. Under the guise of being Pete’s benefactor, Jefty manipulates and toys with him and Lili in progressively more heinous ways – culminating in a truly riveting climax at his hunting cabin. Imagine if Tommy Udo had a hunting rifle and got drunk, yeah, that’s what the tension is like during Road House‘s climax. 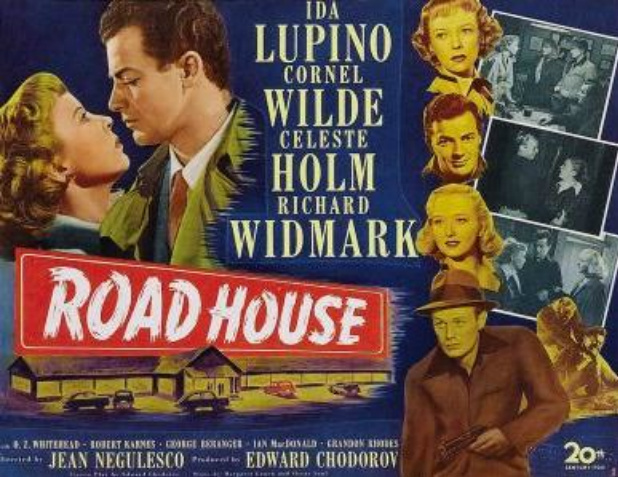 While it doesn’t chart the same fall from grace path of most noirs, Road House, is so badass in its presentation of a standard love triangle gone to hell that it belongs in the upper echelons of the genre. This shared lust doesn’t just break up the long-time friendship between Pete and Jefty – it leads to them wanting to seriously murder each other. Watching Widmark deflate his humanity at the end is PAINFUL. My heart went out to Widmark at this film. He’s the real underdog here – he’s less attractive, more naive, more of a sap than Pete. My heart goes out to Jefty. Road House may not have Patrick Swayze ripping people’s throats out, but it does have plenty of noir aesthetics and Widmark doing what he did best at this point. Not to mention Ida Lupino soaking in the camera with her voice and tough-as-nails actions. Seriously, if you wanna see a woman wanna chew scenery in a noir, check out Lupino in Road House. This is one honest to god romantic, tough, dark little noir.